The resort was purchased by the Garment Workers’ Union in 1919 as a reasonably priced place for its members to vacation. In 1924, the property was sold to the General Executive Board of the International Ladies’ Garment Workers Union. The union renovated the building and transformed it into a wonderland for the workers, according to Walker. The resort featured a lake with plenty or watersports, a theater, a library and an abundance of activities to keep guests entertained. Now, the front desk, bar and theater at the resort all lie crumbling and derelict. 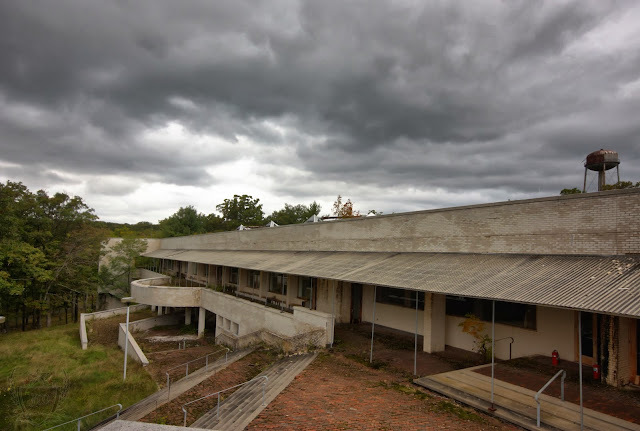 The photographer, who is based out of New York, says he finds old hotels incredibly "interesting” and has photographed many abandoned summer resorts in the Catskill Mountains in upstate New York. When Walker is shooting at an abandoned location, he prefers a little cloud cover to set the scene. “Cloudy or overcast days I think make outside pictures more interesting to look at … gives them a moody feeling,” said Walker.